UIC Chancellor Michael Amiridis made remarks about standout achievements, persisting challenges and goals for UIC’s growth in a formal address to the university community and guests April 4 at the UIC Forum. 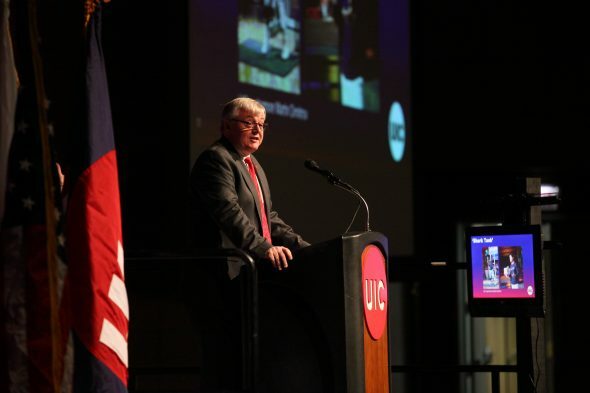 The talk, titled the “State of UIC,” is held annually. This year, Amiridis began his delivery by praising UIC’s ability to survive the record-setting budget stalemate, which ended in July. “All of you have played a critical role in moving our university forward during these challenging times, and I’m grateful for your persistence, your drive and your fortitude,” Amiridis said, thanking staff and stakeholders. He moved on to spotlight UIC’s commitment to remaining an outstanding global research university with goals of improving the student experience and quality of education; growing the university’s national and international reputation for research and scholarship; enhancing community engagement; and building a more sustainable framework. Among UIC’s remarkable achievements is a third year of record-breaking enrollments, totaling 30,500 students in the fall, a 5 percent increase from last year. The number makes UIC the largest university in Chicago and second largest in Illinois. Additionally, university leaders continued a four-year tuition freeze, and about $60 million in scholarships were awarded to students apart from federal aid, MAP grants and external awards or scholarships from places like the National Science Foundation. “This is what commitment to affordability means,” Amiridis said. UIC is also civically responsible. Last year, UIC was named a Voter Friendly Campus and won the ALL IN Campus Democracy Challenge, a national award for student voter engagement. Amiridis noted that the university earned other top spots. In academics, the Wall Street Journal/Times Higher Education ranked UIC 23rd in the U.S. among public universities. Discussions will continue on the John Marshall Law School becoming part of the university. On the field, the softball, baseball and men’s soccer teams competed in NCAA tournaments, and 218 Flames had GPAs of 3.0 or higher during the fall. Nearly 50 achieved a 4.0. UIC had more than $240 million in research expenditures in fiscal year 2017. Researchers have over 300 patents in their portfolios. Faculty in humanities were lauded by the New York Times Book Review, Times Literary Supplement and the Los Angeles Review of Books. For health care, the focus turned to UIC’s Robotic Surgery Center of Excellence, which is the first of its kind in the nation; kidney and liver transplants; retinal implants; and community outreach initiatives. The Chancellor highlighted the UI Cancer Center’s National Cancer Institute designation, and shared that UI Health will extend its new pilot program called Better Health Through Housing, which moves chronically homeless emergency department patients into stable housing to improve health and reduce hospital costs. These accomplishments “all point in the same direction. A direction of growth and momentum,” said Amiridis. Moving forward, leaders will finalize an updated campus master plan to improve facilities and grounds over the next 10 years. Construction has begun on two major projects: a public-private partnership for new live-learn facilities on Harrison Street and an Engineering Innovation Building. “These two facilities are just the beginning,” said Amiridis. The final master plan, which will be shared later this year, will do more to “support and enable the achievement of our strategic priorities,” he added. A five-year fundraising campaign, called IGNITE, aims to raise $750 million to push that vision forward. Funds from alumni and friends will be used to recruit top faculty, fuel research, and more. Gifts of $10 million in 2017 were allocated to a nursing lab expansion and a deanship in pharmacy. A newly launched Alumni Association is finding other meaningful ways for alumni to engage with and support their alma mater. Overall, the Chancellor says the future looks bright. “For all of the reasons that I have mentioned today, I have enormous pride in our institution,” he said. A recording of the address can be viewed on the Chancellor’s website.